Great news, the money is in the bank! We’re one step closer to getting this threat removed. approximately 100 members of the Brule River Sportsmen’s Club. Together, these non-governmental efforts raised almost $60,000. The WDNR has also committed an additional $45,000 in state trout stamp funds. With the WDNR’s recently awarded USFWS grant, these funds put us one step closer to achieving the goal of removing the South Shore & Atlantic Railroad Culvert/Grade. The success of this fundraising efforts is a testament to how important the Brule is to so many people! Land ownership Issue – There are still issues to be resolved. The grade/culvert removal requires a water regulatory permit needing landowner consent, and abandoned railroad lines are some of the most challenging land parcels when it comes to determining land ownership. The Duluth South Shore and Atlantic Railroad (DSS&A) built this rail line in 1882. The rail line crossed 2 streams, Nebagamon Creek and the main stem of the Brule. This rail section was abandoned in 1934. The bridge spanning the Brule (located at the foot of Station Rapids – a short distance upstream of County Highway B) was removed at abandonment, but the grade and culvert at Nebagamon Creek was not. DSS&A merged with other rail lines in the early 1960s. Ownership of this abandoned line has become confounded as the different rail companies merged and/or changed names over the years. 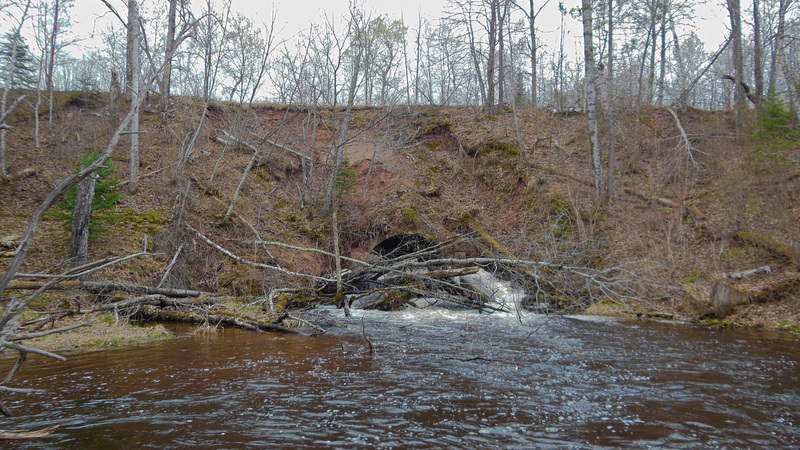 This past year, Brule River Preservation (to learn more about Brule River Preservation, click on Brule Preservation) funded a land title search to identify the present landowner(s) and also funded a detailed property survey. To view a short drone video of the South Shore Grade site taken last spring by Sam Alvar of Seaquest Photography, click on South Shore Video. To read last summer’s DNR’s summary of the project’s status, click on South Shore Status.